The chief end of man may be to glorify God and enjoy him forever…it’s just that the “glorify God” part offers a pretty wide array of options. And what better way to glorify God than to make a delicious brew? The problem is that resources are tight at the monastery, and in order to make a superior ale you’ll have to sell your cast-offs at the market. Not that the commoners can taste much of a difference anyway. But brewing beer is a tough business, with several elements needing to be just right. Thankfully, with a band of brothers sharing the load, a wise brewmaster at the helm, and lots and lots of prayer, the best ale this side of heaven is just within your grasp. Heaven and Ale set up for two players. 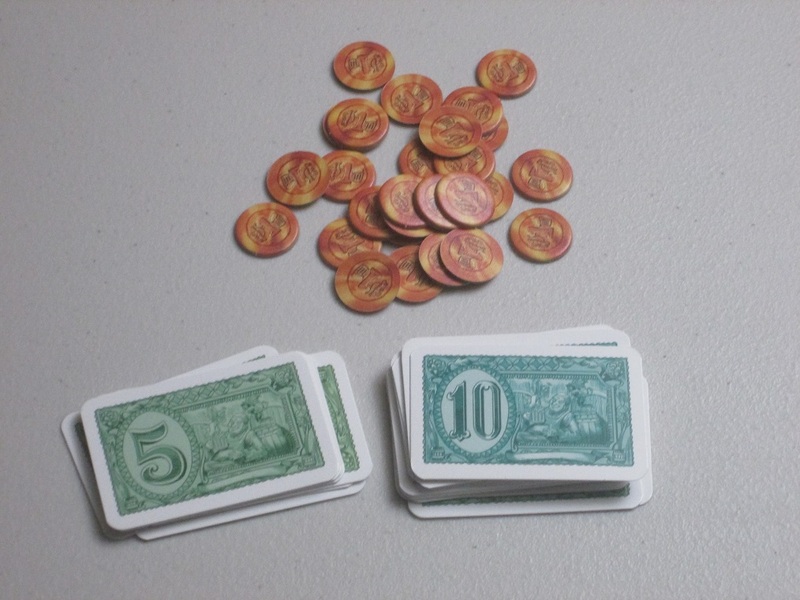 To begin, each player receives a farm board, a marker in each of the five ingredients’ colors, a brewmaster token, a player figure to move around the main board, 25 ducats, and five favor cards. The main board is set up, with stacks of monks placed face down on the round spaces (according to the number of players), and tiles are placed on their corresponding spaces around the board. Each player receives a starting reward, and play moves clockwise from the start player. On their turn, players move their figure clockwise around the board and perform the action where they land. 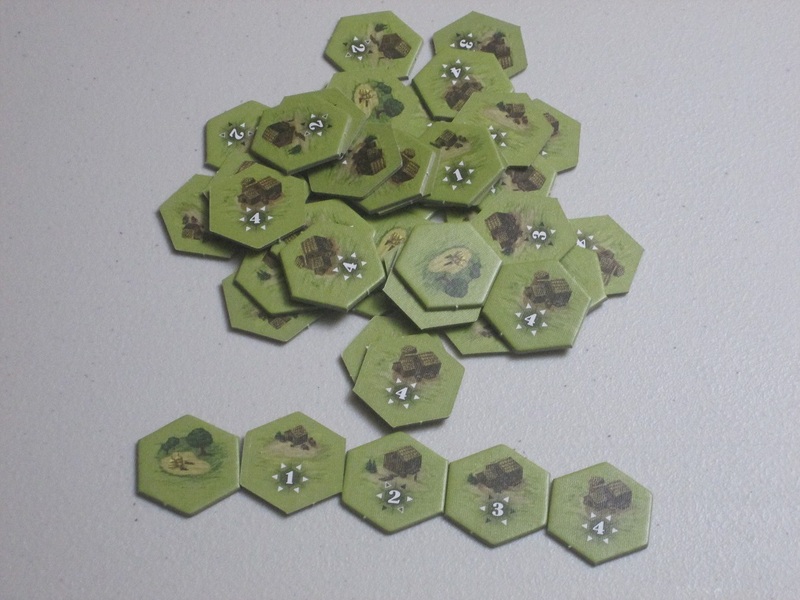 Most spots have tiles, and players pay the price on the tile to put it on their personal farm boards. Each farm board is divided in two–a shady side and a sunny side, offering income or points, respectively. To place a tile on the shady side, the player pays the tile’s value; to place on the sunny side, the player pays two times the value. Tiles are either fertility tiles, which provide income or increase the quality of ingredients, or monks, which can activate other tiles and move the brewmaster forward. Each farm board has a number of shed spaces on the board, and when a shed is completely surrounded by other tiles, players place a shed tile on the space corresponding to the value of the tiles surrounding it. The shed might move the brewmaster forward or provide bonus activations for the tiles surrounding it. Twelve special scoring conditions are present in every game. These provide an additional way to score points. Players move clockwise around the board and may never move back once a space is passed. When a player has nowhere else they want to or can go, they move their figure to the start area and choose a benefit (going first, moving their brewmaster, increasing the quality of one of their ingredients, or getting extra money). Once all players have done this, a new round begins. After a set number of rounds determined by player count, the game is scored. Players trade ingredients according to a rate determined by their brewmaster to make all ingredient quality as equal as possible. Then, they multiply their lowest ingredient by the multiplier determined by their brewmaster and add any points from claimed barrels during the game. The player with the most points wins. 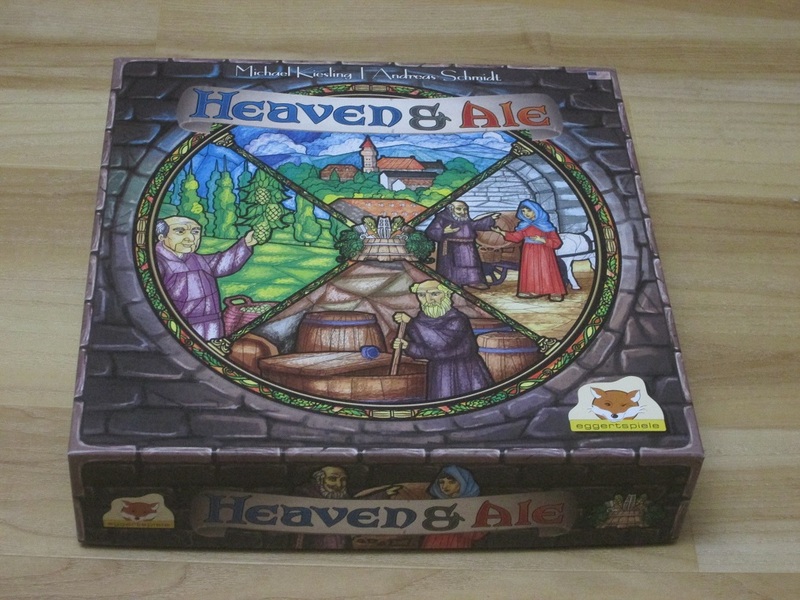 Heaven & Ale is a tricky game to talk about. 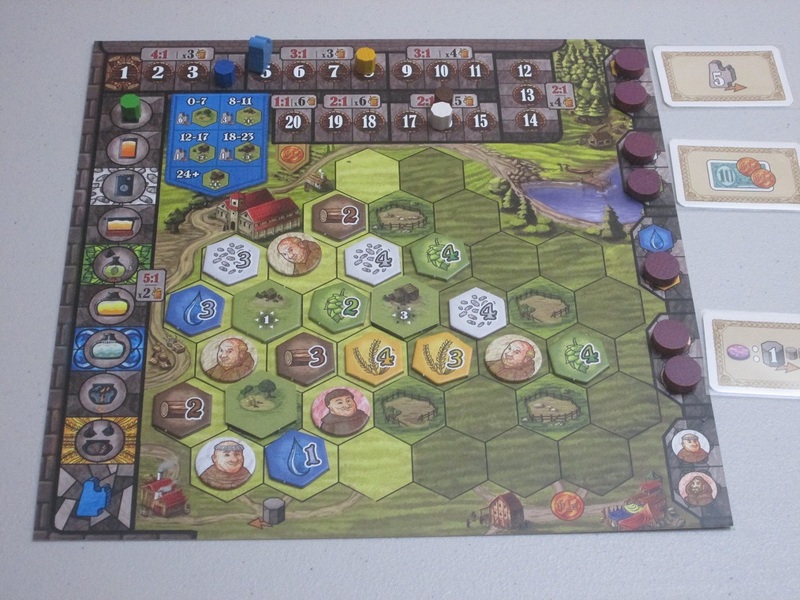 On the one hand, it seems fairly familiar: a farming game with hex tiles; a resource-management game with a tight economy; different scoring markers, each of which must be increased because your score is determined by your lowest; special scoring achievements; dry Euro theme that you have to squint in order to see. On the other hand, I struggle to think of another game that does quite what Heaven & Ale does in quite the way that Heaven & Ale does it. Heaven & Ale is a brutal, punishing, decision-rich, beautiful game. The trait that I value most in board games is trade-offs, or in common parlance, “interesting decisions.” I want each decision I make to matter, and if I choose one thing, I want to feel the pain that I might not get to choose something else. If I’m able to accomplish everything I want to in a game, there’s not much reason to play it again. The games I want to return to, almost without exception, are games that involve strong mechanical FOMO. And this might be Heaven & Ale’s defining trait. Each scoring condition is next to another on the board, and when you score both, you get to play a privilege card. These can be a huge boost. At the heart of Heaven & Ale is a brutal scoring system: you have five ingredients along a track, and at the end of the game, you score the farthest ingredient back. What makes this so brutal is that four of your five ingredients start at various degrees of zero. You don’t start a game of Heaven & Ale with a clean slate; you start at a deficit, and the rest of the game involves you clawing your way out of this situation. The game that most came to my mind in my first games of Heaven & Ale was Agricola, where your goal is to scratch a living from the cold, hard earth, and good luck to you as you feed your family. Beyond your ingredients starting below zero, farthest back on your scoring track is the brewmaster. The brewmaster oversees your brewing technique, and he can usually make up for some deficiency in the ingredients–if he’s a wise and knowledgeable brewmaster, that is. But knowledge, like quality, is hard-won in Heaven & Ale, and finding ways to advance your brewmaster can be difficult. What the brewmaster’s knowledge accomplishes in game terms is twofold, and both functions relate to final scoring: one, the brewmaster allows your best ingredients to compensate for your lesser ingredients in your beer’s score, and two, the brewmaster provides a scoring multiplier for the worst ingredient in the beer. Essentially, you don’t want to neglect your brewmaster because his oversight provides the best opportunity for making quality beer. Your brewmaster determines both the conversion rate for increasing the quality of your worst ingredient and the multiplier for the final scoring. Despite what I’ve said about Heaven & Ale being a grueling game, this doesn’t sound so hard. You just have to move things along a scoring track, right? Enter the next source of brutal trade-offs in the game: the tight economy. 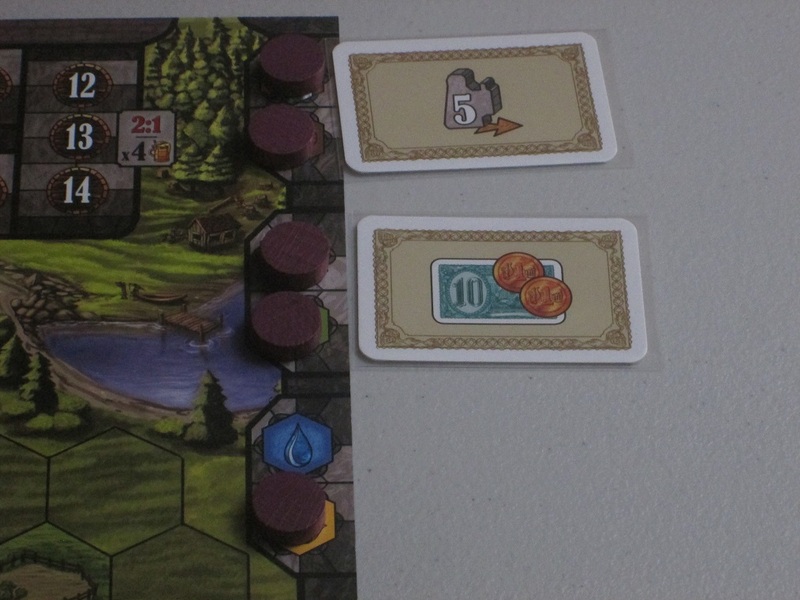 Heaven & Ale starts players with a seemingly generous 25 ducats. Tiles range in values from 1 to 5–that gives plenty of margin. The problem is that money runs out fairly quickly, and players need to generate some income of their own to stay afloat. 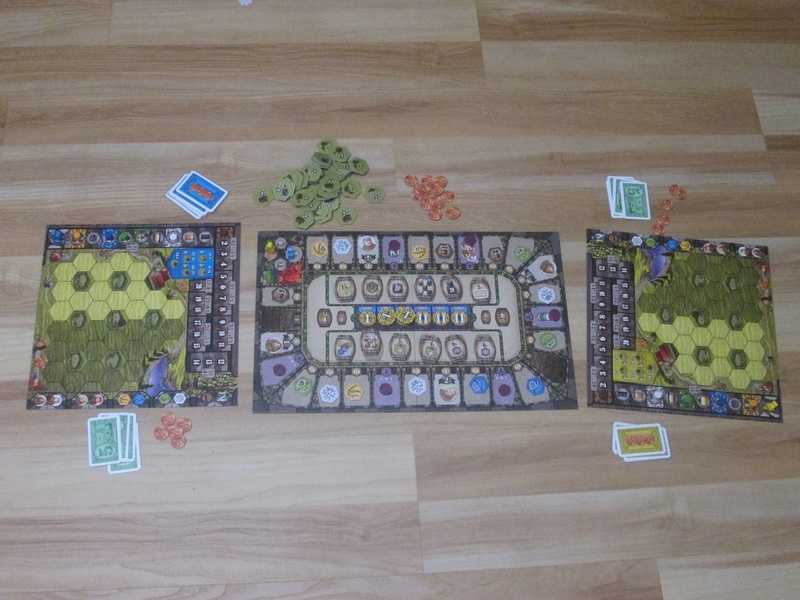 Each player’s farm board has two halves, a shady side and a sunny side. The shady side is where monks grow ingredients to sell at the market. They’re not the best, no, but most people’s palates aren’t refined enough to be able to taste the difference. The sunny side is where the best ingredients grow, and those best ingredients are reserved for beer making, because while you might not be able to taste poor ingredients in everyday fare, you can taste them when they make their way into your stein. Because quality isn’t cheap, in order to place anything on the sunny side of your board, you have to pay double. The only way to improve the ingredients in your beer is to plant them on the sunny side, yet in order to have the money to pay for ingredients for your sunny side, you need cash from your shady side. Can you taste the trade-offs? But getting tiles onto your board is only half the battle. In order for them to do anything, you have to score them. Each player has a maximum of ten opportunities to score during the game–each ingredient and monk type can score once per game, and once per game players can score all tiles of a single value. Once hops is scored, for example, hops can’t be scored the same way again. Because of this, players want to push efficiency: if you’ve only got one chance to score hops, you should try to score it as late as you possibly can. If you’ve only got once chance to score all your 5 tiles, you want to wait until you have lots of 5 tiles primed and ready. But these scoring opportunities are complicated by two factors: the tight economy (sometimes you need money right now), and timing. Timing is the trade-off that completes the grueling cycle of trade-offs in Heaven & Ale, because this is a competitive game played against other players, and thus opportunities to do anything are limited by what the other players do. There are only six scoring discs available per round, which seems generous, especially if you’re playing a four player game with a full six rounds. Four players? Thirty-six discs? Each player has only ten opportunities to score? Only four opportunities lost in a game! That doesn’t sound so bad except that…well, it isn’t that simple. The first three scoring opportunities around the board are limited by type (that is, you can’t score whatever you want with them), and as each player is trying for efficiency, in the early rounds, some of the scoring discs might go unclaimed. Complicating this, too, is that players are racing to claim things around the board, and if another player claims something, you can’t. This pushes players to weigh their options: what do they need most? Do they claim the farm tiles early on that they need? Or do they rush for scoring discs? Or do they go to the barrel spot, snatching the 4-point barrels awarded to the first claimant before another player does the same? Truthfully, players probably won’t be able to do all of this–another player will spoil their plans. This timing aspect is what completes the game and makes it so interesting. 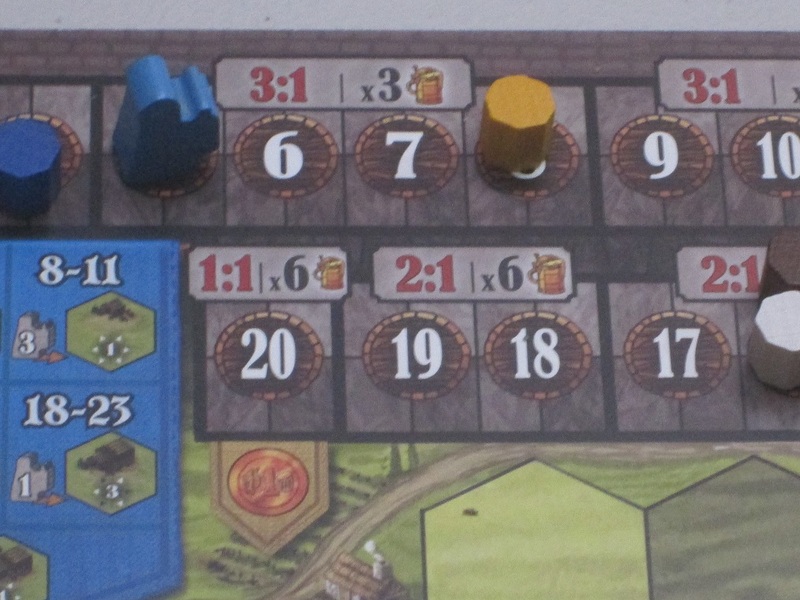 I’ve seen the criticism of Heaven & Ale that it just isn’t dynamic enough–scoring conditions are the same each game, the tiles are the same, the scoring options are the same. Same, same, same. And this sounds legitimate…but I simply don’t buy it. One of my favorite games and one of the best-designed games I’ve played, Ra, has survived twenty years without an expansion, and it still sees regular play in my group. The tiles are the same each game, the scoring conditions are the same. Yet in Ra, as in Heaven & Ale, the point isn’t that the game is the same; it’s that the players are different. Players will make different choices as opportunity and strategy dictate. They will have to. If I determine to strongarm my brewmaster forward each game, that might work until another player claims the monks that do this best. If I aim to plant the 5-value tiles on my board each game, this might work, but other players have equal access to them, and depending on where the tiles come out and how valuable they are to other players, I likely won’t get all of them that I want. Also, not all the tiles make it out each game, so there might be a shortage of one ingredient, or one number, and so on. Each game is new and fresh not because of the artificial replayability of variety but because of the very real and important point that this is a game of heavy player interaction, where watching your fellow players is as important as harvesting quality ingredients. And thus the trade-offs of time are central to the whole puzzle. My wife and I roll our eyes at the Viking River Cruise president on the commercials that precede Masterpiece, who claims that “time is the only scarce commodity.” (Easy for you to say, pal, when you’re rolling in your millions selling cruise tickets.) But in Heaven & Ale, this sentiment is a lot more true: time might not be the only scarce commodity, but it’s potentially the scarcest. When monks are scored, they activate every adjacent tile. This can be a boon to activating good tiles again and again. Monks also have a value of zero when placing sheds, so to get the sheds that move the brewmaster the farthest, monks are almost a necessity. Everything I’ve described probably sounds more like work than a game, and there is some truth to that. But what keeps my mind thinking about Heaven & Ale even after I’ve left the table and what keeps me wanting to bring it back to the table is how satisfying the game is when you pull your plans off. 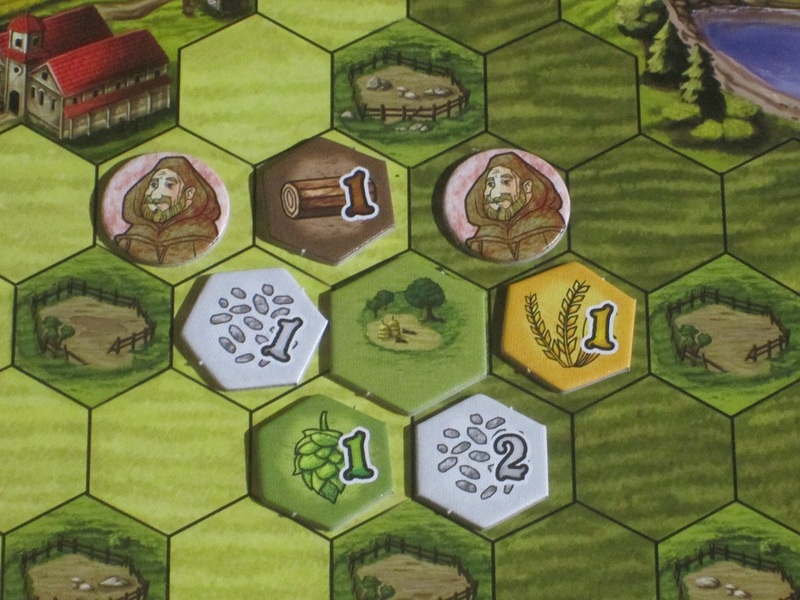 Just as in Agricola, where you start with next to nothing and are barely making ends meet and then you have a bustling farm, Heaven & Ale gives players a sense of progression, and there are lots of interesting combos to explore and exploit. Enclosing shed spaces, for example, allows you to activate tiles you might have already scored. Scoring privilege pairs allows you extra goodies if you can eschew the promise of fast cash early on. If you can shrewdly organize your monks around the board, you can activate disparate tiles in a single scoring. You’re playing with other players, and this game is highly interactive–you shouldn’t expect your plans to go off without a hitch. But when a plan comes together that is even moderately successful, it feels like the clouds have parted and heaven is smiling on your modest endeavors. It’s hard to describe the joy that results from finally–finally–getting out from behind the eight ball. Of course, for some, the criticism is that you might never get out from behind the eight ball. Shed tiles are a great way to get extra activations. But you have to plan carefully to get the right shed tile to activate the right tiles. This is a fun wrinkle to the game. The components in Heaven & Ale are nice–I love the stained-glass artwork, the tiles are on thick punchboard, and most things are functional. I’m not a fan of the mix of token money and card money, but I usually substitute with other coins anyway. I would have appreciated a draw bag for the fertility tiles, but most other games skimp on the draw bag, so it’s probably not worth it to ding Heaven & Ale for that. What sours me a little on the components, though, is the price. The MSRP is $69.99, and when compared to other games in this price bracket, Heaven & Ale comes off looking a little shabby, like it could have stood to abandon its humble habit if it was going to collect so much in alms. But you know what? I paid OLGS prices for the game–which were still higher than I like to pay, nearly $50–and I’m not disappointed with the game I got for that price. It’s a great game that I like playing. You’ll just have to remind yourself through gritted teeth when you add it to your cart that the game has other virtues than price. 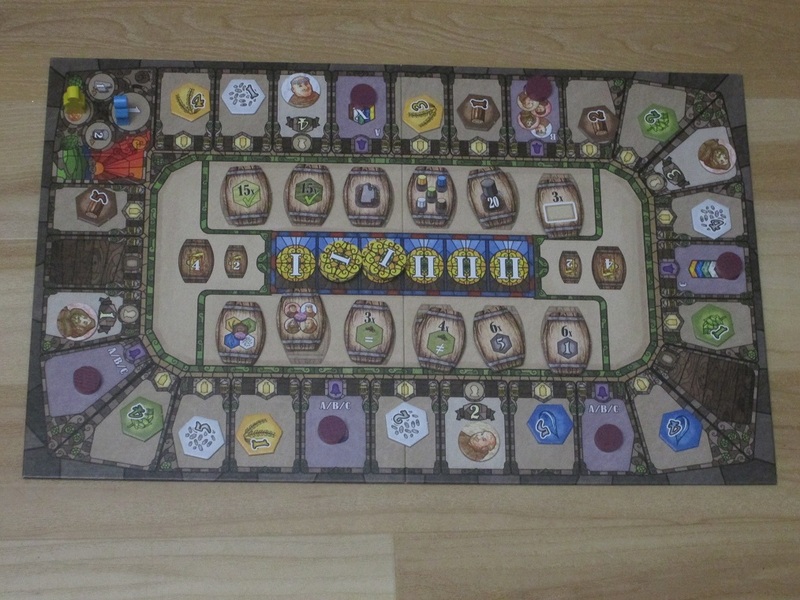 A close-up of the board at the start of a two-player game. I’ve played the game with three and four players–I don’t usually play games like this with just two–and I liked it at both counts. I did prefer it with four to three, but the fast playing time with three was refreshing. 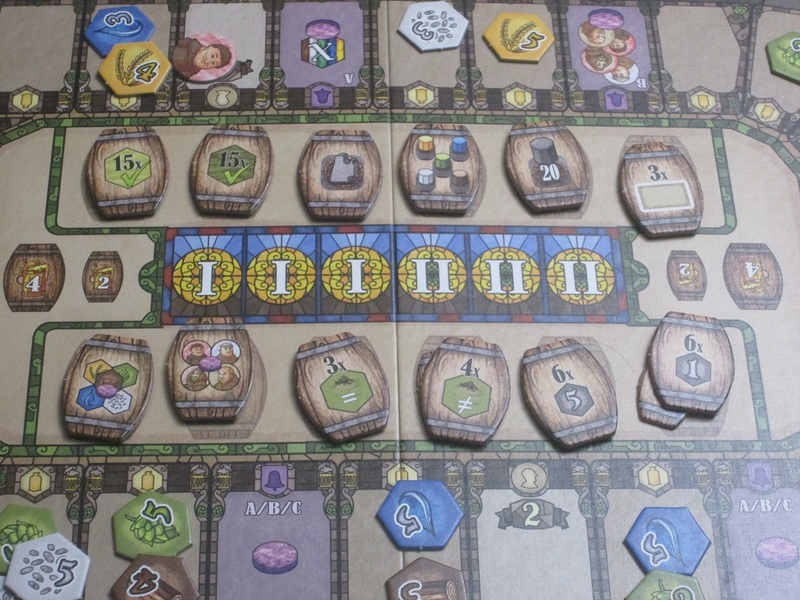 For a game with this depth of decisions, Heaven & Ale is surprisingly simple to teach, although the wrinkle of when monks activate the tiles around them and when monks just move the brewmaster forward can trip up players learning from the rulebook. (I think I would have been okay from just reading the rulebook, but I found a helpful BGG thread that saved me the trouble before I knew it might be a problem.) All things considered, though, the rules are pretty simple. Figuring out what to do with what you’ve been taught is the hard part. The final board state at the end of the game. This was… not a high-scoring game. It’s not difficult to see, from what I’ve said, why someone might not like Heaven & Ale. The setting is nice, but the feel of being in a monastery’s brewery (or even in a monastery) is almost wholly absent from the game, making Heaven & Ale seem like a mechanical exercise when you step back a bit. The game is tense and punishing, such that even experienced players can be caught under the wheel and post embarrassing scores, and Agricola seems to have a new companion in the “misery farm” category. And the box of components, while fine for what they are, don’t seem commensurate with the price tag. I hear these criticisms. I understand these criticisms. I am even sympathetic to these criticisms. I just don’t care about these criticisms because Heaven & Ale is a game that I want to keep playing. The trade-offs present are some of the best in the business, and the reward of a job well done is high enough that it’s worth a little time in the muck to get there. If you’re someone who values tense and grueling decisions, and who doesn’t mind being kicked around by a brutal system, Heaven & Ale is the right brew for you.